Inaugural Ceremony of Startup Idea for Fund competition was held with the startups of season one and thirty thousand participants. 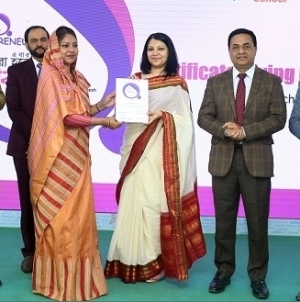 The program introduced the competition internationally in concurrence with the 17th founding anniversary of Daffodil International University (DIU) at its permanent campus at Ashulia. 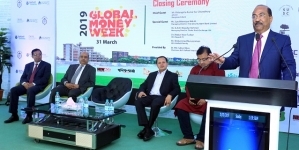 Dr. Jonathan Ortmans, President, Global Entrepreneurship Network (GEN) of United States was present as the chief guest at the Inaugural Ceremony. This enigmatic figure launched the most awaited competition Startup Idea for Fund on January 28, 2019. Dr. Md. Sabur Khan, Chairman, Board of Trustees, Daffodil International University presided over the ceremony. A good number of distinguished guests from home and abroad were also present. Startup Idea for Fund competition was held with thirty thousand participants. Photo: Nadim Choudhury. Dr. Ortmans delivered the keynote address – focusing on entrepreneurship and mobilizing the youth to promote economic development. He said that Bangladesh is now a country of the youth. He hoped Bangladesh will be changed through the energy of this youth. It is an upcoming country with a serious entrepreneurial mindset and a fine destination for the investors and high innovation centric businesses. The Startup Idea for Fund was organized by the Department of Innovation & Entrepreneurship (DIE), Daffodil International University. The competition was coordinated by Mr. Reyed Mia and Ms. Maliha Islam, in association with Bangladesh Venture Capital Limited. 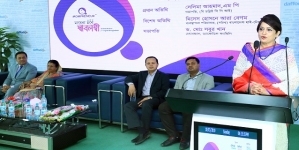 Mr. Mohammed Shibli Shahriar, Head, Department of Innovation & Entrepreneurship guided the launch duly supported by other team members. Dr. Ortmans talked with the students. Startup Idea for Fund team paid a tribute with thirty thousand voices and hundreds of guitars together with respect. The crowd recalled the glorious memory of late freedom fighter, popular songwriter, composer, and music director Ahmed Imtiaz Bulbul and one of the pioneers of band musicians in Bangladesh and a star celebrity, Ayub Bachchu. Daffodil International University (DIU) always encourage students to become an innovator and entrepreneur. Before completing the graduation, the students are taught and mentored not to be a job seeker but to create employment for others. With this motto to develop entrepreneurial ecosystem, DIU organized the startup idea competition named “Startup Idea for Fund” to support innovative ideas and create an entrepreneurial platform where students are provided with fund, incubation, office space, business networking, mentoring, and legal support, etc. 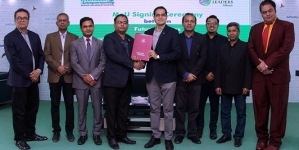 All these initiatives will create an entrepreneurial environment for students to develop their entrepreneurial leadership skills in line with moving towards the vision of Digital Bangladesh.